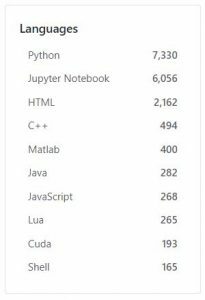 This 100 item list represents a search of github for “deep-learning”, Nov 2017.
bvlc/caffe caffe: a fast open framework for deep learning. fchollet/keras deep learning library for python. runs on tensorflow, theano, or cntk. zuzoovn/machine-learning-for-software-engineers a complete daily plan for studying to become a machine learning engineer. songrotek/deep-learning-papers-reading-roadmap deep learning papers reading roadmap for anyone who are eager to learn this amazing tech! christoschristofidis/awesome-deep-learning a curated list of awesome deep learning tutorials, projects and communities. udacity/deep-learning repo for the deep learning nanodegree foundations program. cmusatyalab/openface face recognition with deep neural networks. lisa-lab/deeplearningtutorials deep learning tutorial notes and code. see the wiki for more info. chiphuyen/stanford-tensorflow-tutorials this repository contains code examples for the course cs 20si: tensorflow for deep learning research. tflearn/tflearn deep learning library featuring a higher-level api for tensorflow. bulutyazilim/awesome-datascience ? an awesome data science repository to learn and apply for real world problems. caffe2/caffe2 caffe2 is a lightweight, modular, and scalable deep learning framework. hangtwenty/dive-into-machine-learning dive into machine learning with python jupyter notebook and scikit-learn! lazyprogrammer/machine_learning_examples a collection of machine learning examples and tutorials. yenchenlin/deeplearningflappybird flappy bird hack using deep reinforcement learning (deep q-learning). lengstrom/fast-style-transfer tensorflow cnn for fast style transfer! hironsan/bosssensor hide screen when boss is approaching. alexjc/neural-enhance super resolution for images using deep learning. fchollet/deep-learning-models keras code and weights files for popular deep learning models. zsdonghao/tensorlayer tensorlayer: deep learning and reinforcement learning library for researcher and engineer. junyanz/cyclegan software that can generate photos from paintings, turn horses into zebras, perform style transfer, and more. vahidk/effectivetensorflow tensorflow tutorials and best practices. martin-gorner/tensorflow-mnist-tutorial sample code for “tensorflow and deep learning, without a phd” presentation and code lab. swift-ai/swift-ai the swift machine learning library. liuzhuang13/densenet densely connected convolutional networks, in cvpr 2017 (best paper award). nitishsrivastava/deepnet implementation of some deep learning algorithms. spandan-madan/deeplearningproject an in-depth machine learning tutorial introducing readers to a whole machine learning pipeline from scratch. pair-code/deeplearnjs hardware-accelerated deep learning and linear algebra (numpy) library for the web.